You are what you eat, so eat beautifully! This is my version of Jamie Oliver’s Butternut Squash Soup recipe, which I have been making religiously every fall for the past 5 years! 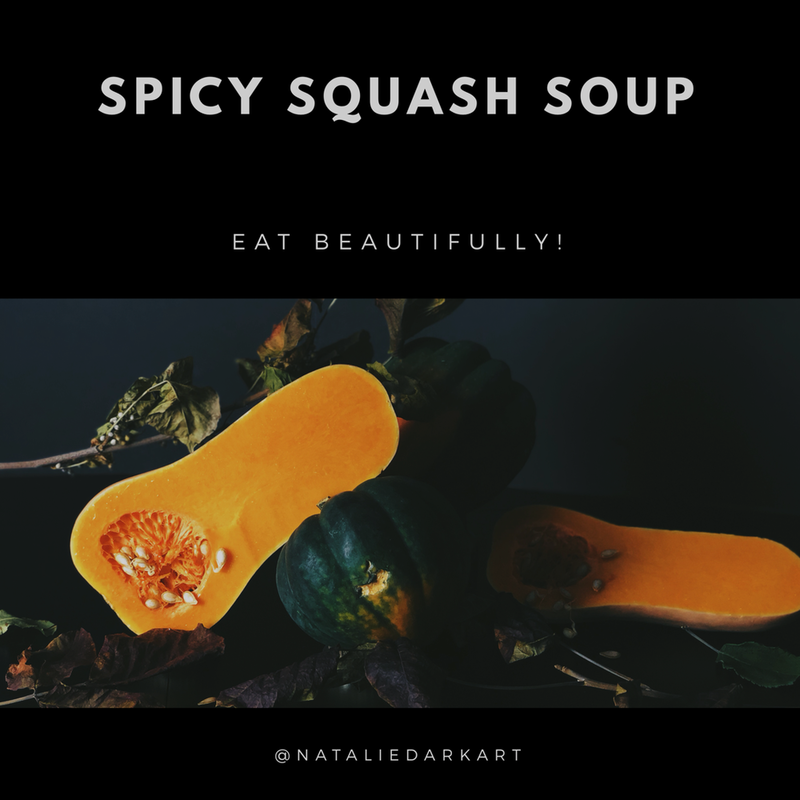 My husband & I can’t ever get enough of it, and this year I am going to switch it up just a little bit more by making it with a couple types of squash (not just butternut!). I never follow a recipe 100%, but that is even more true ever since I started to create these food based still lifes. I am finding myself with LOTS of leftover food that I have no idea how to use. Basically, I buy produce that LOOKS pretty, but not necessarily because I am going to eat it…and then I am left with SO. MUCH. WASTE. So, I decided I needed to get creative & start incorporating my art into my meals! We loved how this turned out & it freezes really well, so make a ton & enjoy all fall/winter long (or even as a Thanksgiving side)! *Delicious Side Note: Jaime’s recipe includes Parmesan croutons & I highly recommend if you are serving this at Thanksgiving (just thinking about them is making my mouth water)…but if you are just making for dinner, I typically skip the hassle & just serve with a fresh baguette from the grocery store. *Other Delicious Side Note: I wanted a side dish & had some red chard lying around from a still life. Figured why not just pair the two?! Recipe for that linked here! *when I am in a rush I just cut out the fresh herbs & stick with the dried versions in my spice drawer…seriously, who can be bothered?! Before you get started, just remember we are blending this all together, so just chop it & toss it, no stress! Peel/trim & chop up the onions, carrots, garlic, & celery. Deseed and finely chop the chilli. Pick and finely chop the rosemary. Or toss in the dried version if using that. Heat a couple of lugs of olive oil in a large pot over medium heat, add the sage leaves and fry until crisp (~30 seconds), then remove to paper towel. If I am using sage powder then I just skip this step & add it in with the rest in step 5. Add the onion, carrot, garlic, celery, chilli, rosemary and a good pinch of sea salt (only add if using sodium free stock/bouillon, else skip) and black pepper to the sage flavored oil, then cook gently for 10 minutes, or until softened. While veggies are cooking, peel, halve, deseed and rough chop the squash. When the veggies are soft, add the squash and stock to the pot. Bring to a boil and simmer for 30 minutes. When the squash is tender, whiz the soup with a stick blender or pour it into a blender and pulse to a smooth purée – leave it slightly chunky, if you prefer. Season to perfection with salt and pepper, then divide between bowls. Sprinkle with a few crispy sage leaves, grated parmesan, and serve with a crusty french baguette!